A wooden-arched, double deck package freight steamer; built 1864, Cleveland, 0.; 238 x 35 x 13.5. Her power came from twin screw steeple compound engines, and two low steam box boilers; burned to water's edge 1871, St. Mary's river. Rebuilt; gr. tonnage, 1432. This steamer operated on many routes and scores of engineers, captains, mates & seamen sailed on her. 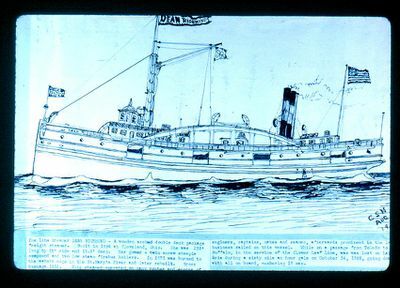 While on a passage from Toledo to Buffalo (Clover Leaf line), she was lost on Lake Erie in a 60-mile gale, Oct. 14, 1893, going down with all on board, some 18 men. Listed Inland Lloyds Vessel Register, 1893. Also Beers, History of the Great Lakes, Vol. 1, p. 880 & p.765.